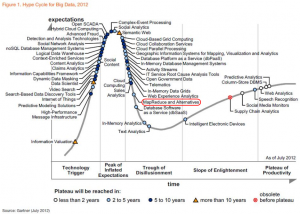 Convergence of Cloud Computing & Big Data???? For those who don’t know what big data is, this Intel Video gives you a “Big Data 101” primer. The Cloud definitely provides a cost effect and timely way to go after big data problems and then using the elasticity of the cloud’s IaaS foundation, dump the costly resources when you’ve finished or allow them to grow only when needed. But they are not one and the same. Big Data is just the current “Bell of the ball” for enterprise usage of the Cloud. 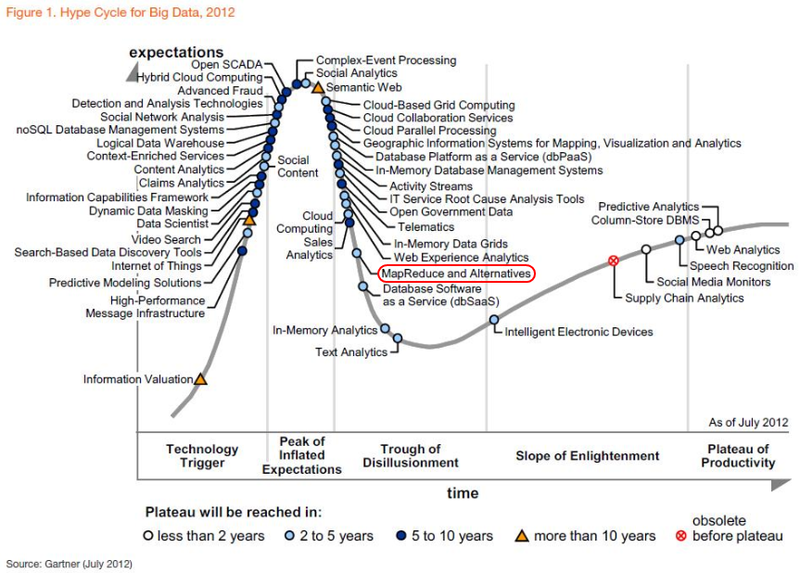 See below Gartner’s Hype Cycle for emerging technologies 2012. This shows we are either in or approaching the “Trough of Disillusionment” regarding Reduce Map and the offerings of DBSaaS. I’m eager to apply some innovative ideas I have regarding the trip out of this trough on some upcoming projects. Microsoft buys Nokia… So what? We announced some exciting news today: We have entered into an agreement to purchase Nokia’s Devices & Services business, which includes their smartphone and mobile phone businesses, their award-winning design team, manufacturing and assembly facilities around the world, and teams devoted to operations, sales, marketing and support. For Microsoft, this is a bold step into the future and the next big phase of the transformation we announced on July 11. 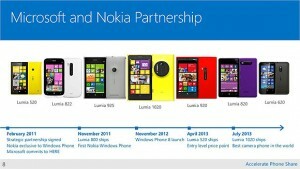 We are very excited about the proposal to bring the best mobile device efforts of Microsoft and Nokia together. Our Windows Phone partnership over the past two and half years has yielded incredible work – the stunning Lumia 1020 is a great example. Our partnership has also yielded incredible growth. 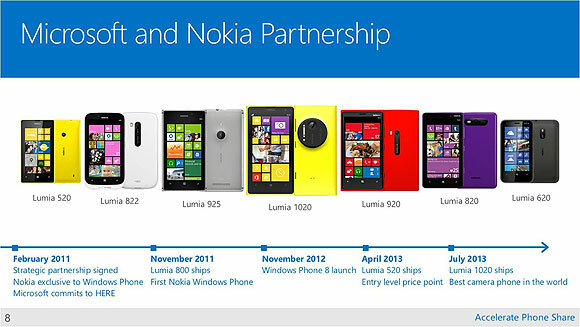 In fact, Nokia Windows Phones are the fastest-growing phones in the smartphone market. Now is the time to build on this momentum and accelerate our share and profits in phones. Clearly, greater success with phones will strengthen the overall opportunity for us and our partners to deliver on our strategy to create a family of devices and services for individuals and businesses that empower people around the globe at home, at work and on the go, for the activities they value most. We have laid out Microsoft’s strategic rationale for this transaction in a presentation that I encourage you to read. This is a smart acquisition for Microsoft, and a good deal for both companies. We are receiving incredible talent, technology and IP. We’ve all seen the amazing work that Nokia and Microsoft have done together. Given our long partnership with Nokia and the many key Nokia leaders that are joining Microsoft, we expect a smooth transition and great execution. As is always the case with an acquisition, the first priority is to keep driving through close, which we expect in the first quarter of 2014, following approval by Nokia’s shareholders, regulatory approvals, and other closing conditions. 1. Stephen Elop will be coming back to Microsoft, and he will lead an expanded Devices team, which includes all of our current Devices and Studios work and most of the teams coming over from Nokia, reporting to me. 2. Julie Larson-Green will continue to run the Devices and Studios team, and will be focused on the big launches this fall including Xbox One and our Surface enhancements. Julie will be joining Stephen’s team once the acquisition closes, and will work with him to shape the new organization. 4. Regarding the sales team, we plan to keep the Nokia field team, led by Chris Weber, intact and as the nexus of the devices sales effort, so that we can continue to build sales momentum. After the deal closes, Chris and his team will be placed under Kevin Turner. We will develop a single integrated team that is selling to operators, and there may be other integration opportunities that we can pursue. Kevin will work with Chris Weber and Chris Capossela to make those plans. 5. Our operating system team under Terry Myerson will continue unchanged, with a mission of supporting both first-party and third-party hardware innovation. We are committed to working with partners, helping them build great products and great businesses on our platform, and we believe this deal will increase our partner value proposition over time. The established rhythms and ways of working between Terry and his team and the incoming Nokia team will serve us well to ensure that we do not disrupt our building momentum. 6. We are planning to integrate all global marketing under Tami Reller and Mark Penn. It is very important that we pursue a unified brand and advertising strategy as soon as possible. 7. Finance, Legal, HR, Communications, DX / Evangelism, Customer Care and Business Development will integrate functionally at Microsoft. Sourcing, customer logistics and supply chain will be part of Stephen’s Devices organization. ICM / IT will also integrate functionally for traditional IT roles. We will need to work through the implications for factory systems given the differing manufacturing processes and systems at both Nokia and Microsoft. 8. We plan to pursue a single set of supporting services for our devices, and we will figure out how to combine the great Nokia efforts into our Microsoft services as we go through the integration process. 9. There are no significant plans to shift where work is done in the world as we integrate, so we expect the Nokia teams to stay largely in place, geographically. 10. Tom Gibbons will lead the integration work for Microsoft. While today’s announcement is big news, we have to stay heavily focused on running the current business. We have a huge fall and holiday season ahead of us, so we need to execute flawlessly and continue to drive our business forward. I have no doubt we will. The dramatic growth in smartphone, tablet and vertical market portable devices e.g., medical instrumentation is starting to drive major change at big tech companies. If you watch product offerings and new positioning of Google, Microsoft, and Apple, you’ll see that significant investments are geared toward the mobile consumer and mobile information worker. These products require new device technologies such as flexible silicon and Thin flexible substrates for interconnect technology. Hopefully this will open Intel up to address new markets and new types of Si architecture along with manufacturing processes. Also the industry will hopefully follow Intel’s lead and innovate even more in this hot technology domain When you look at flexible silicon and thin film technologies, the future is clear. New companies will grow to tech giants that embrace this technology and benefit from lessons learned from the old tech giants. The information age has brought about the rise of a new type of technology company. These are companies where the products or services they produce/provide are intrinsically connected to the IT infrastructure required to sustain the enterprise’s day to day operations. Unlike a food processor where the consumer product is supported by technology but disconnected once it is consumed. In these enterprises, the consumer buys a product/service that links them back into the enterprise’s IT infrastructure and the company monetizes this connection in order to perpetuate business and seduce the consumer down the path to purchasing more and more offerings to leverage the established link. Even giants like Microsoft are going this way by eliminating free Hotmail and replacing it with free online Outlook and SkyDrive space in the cloud. Companies who identify their current reliance on IT as a part of their business value proposition will be able to take advantage of this fact to create strategic inflection points. They will use adjunct offerings that take the enterprise to a new level of revenue and profitability. “Quick” tactical offerings with IT infrastructure “come-along” benefits will seed the prime rose path leading the consumer to partake in future offerings built upon a baseline infrastructure. Emergence of these new Technology Giants will be driven by executive leadership recognizing that IT isn’t just a necessary evil but rather an important platform allowing the launch of never before revenue models and opportunities. The IaaS and PaaS cloud models allow architects to decouple components of an application or enterprise system into the lowest functional components and design for failure how these pieces can be utilized as “independent black boxes” to form an application. 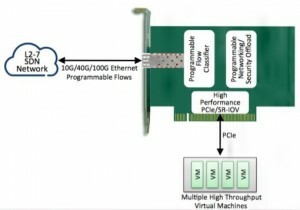 This allows for provisioning elasticity and resiliency of individual components and their states in the inevitable event of hardware or software failure. One of the least understood impacts of this approach is that the message queues used by components can become the most important elements in assuring availability, scalability and ultimate reliability. 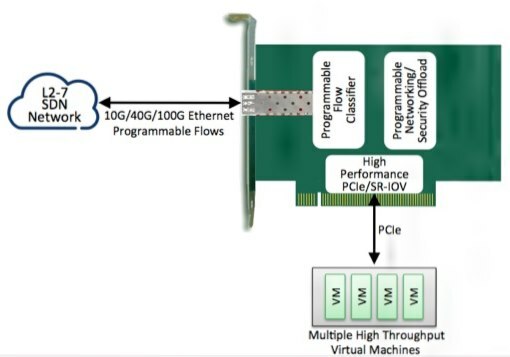 In essence the messaging infrastructure components become the most critical parts of an applications infrastructure designed to exploit elasticity. If you envision these Enterprise Apps as complex organisms, then the message queues and their reliability become mission critical organs of the living, agile enterprise architecture. Components such as controller apps, databases and such should be isolated allowing buffering of request along with replies making the network of components more durable and state independent facilitating failover and scalability. 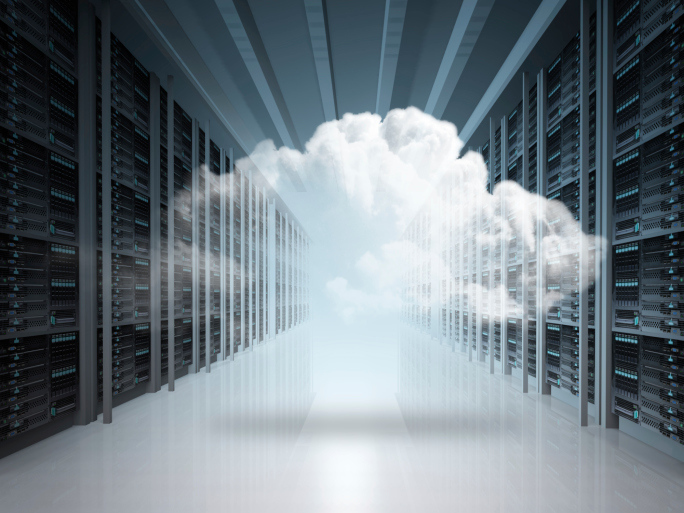 As enterprises come to grips with Cloud Computing demands (both internal and external) the IT groups will soon realize that the Hybrid model is the “best fit” for the new Enterprise IT organization. This will also force a closer alignment with various business units and provoke a rethink of the costing models for IT. can IT really stay a coast center given the inevitable variable demand curve of Cloud Services? Enterprise IT shops will consider various vendors (E.G., Azure, HP, VMware, Amazon & others) in light of the matrix created by matching customers service type needs to flexibility of leveraging a vendors Cloud Service offerings to suit the enterprise’s complex business needs. the ease of entrance and exit will be the driving forces behind vendor selection not just cost but ease of achieving true operational excellence.